Rival IQ gives you the ability to learn "more about me" - specifically we make it easy for you to review the information you would see in your Facebook Insights feature right inside of Rival IQ. To get started using Rival IQ Facebook Insights, you'll need to be an analyst or admin for at least one of the companies in your Rival IQ landscape. 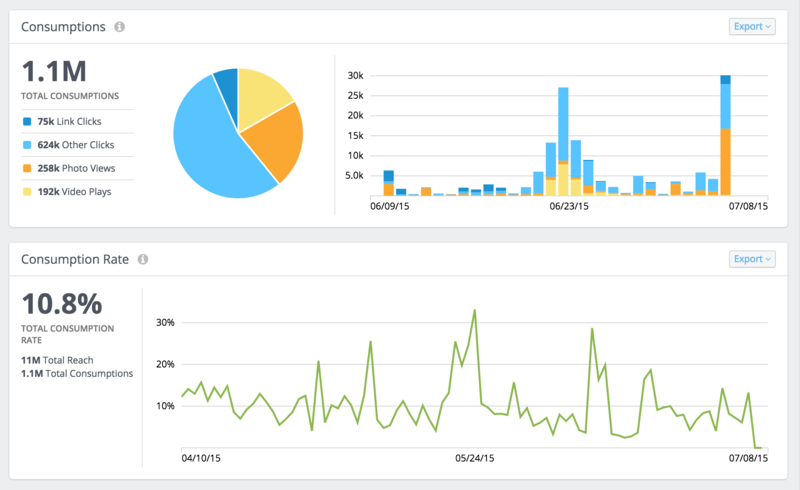 Then, go to the Facebook Insights page in Rival IQ and authorize Rival IQ to read your Facebook page data. 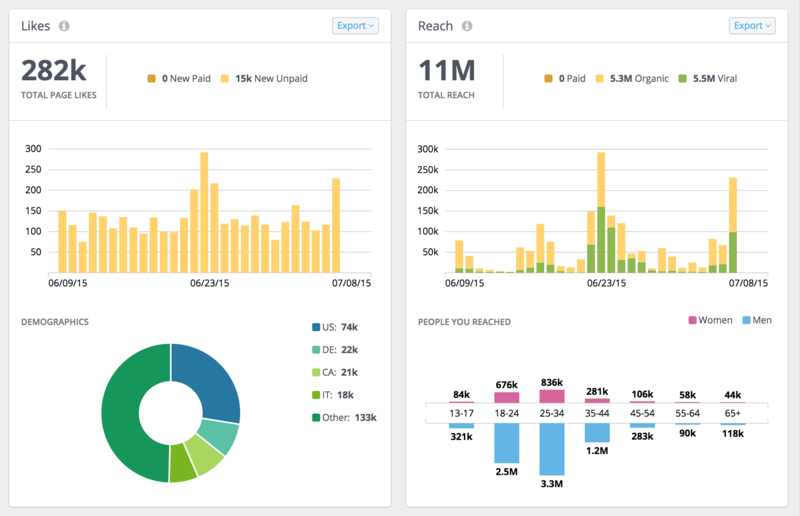 The Facebook Insights Dashboard gives you a snapshot of your audience, reach, and engagement during any period of time. When you need to dig into any of these areas, the Dashboard provides further context right on screen. At a Glance: Displays your current overall performance and trending data to give you context and provide you with additional details. Likes: Shows how many page fans you’ve earned during the period, with a clear visualization of how you’ve grown over time and whether paid or organic activity is the driver for those fans. Additionally, the demographics section of the Likes panel illustrates the home countries of your page fans. 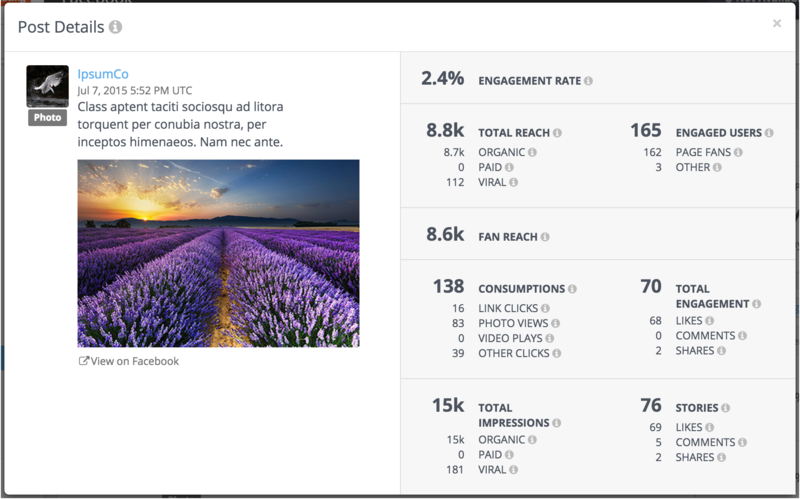 Reach: Breaks down your page and post impressions during the selected period, showing you whether your impressions were driven by organic Facebook views, paid content, or viral reach resulting from content engagement. Also, the reach panel displays the age range and gender of the Facebook users you reached. Consumptions: Covers how many consumptions (clicks) your posts have garnered and breaks them down type, including link clicks, photo views, video plays, and other clicks. Consumption Rate: Gives you an idea about what percentage of Facebook users that see your content click on it in some way. This allows you to see what works and analyze what content you publish, when you publish it, and how you promote it. For every post you publish on your Facebook page, there are a wealth of metrics available to you — metrics that can shine a light on which types of content get shared most, how successful your paid targeting was for a particular post, or which of your videos has the best viewer engagement. Having access to all of these metrics and answering these types of key questions is challenging in the Facebook native Insights page. Another key part of your Facebook Insights Dashboard in Rival IQ is a complete Posts panel that enables you to answer these questions in three ways. Filter posts by type, only considering posts that you are trying to analyze (e.g. video). Use our Manage Columns functionality to choose only the metrics that are meaningful to you from the sea of metrics in Facebook. If you are someone who has spent a lot of time with exported spreadsheets from Facebook Insights in the past, you are going to love this feature. Click on any post in our system to get the full set of metrics for this post, including video engagement. Just like any other metric in Rival IQ, you can customize, Favorite and export any Facebook Insights chart with the Rival IQ system. So now you can consolidate your Facebook reporting to one place right within your favorite analytics tool!